Use It, Share It, Save It! Win One Of These Prizes! Please help us learn about Native languages and their use in our communities. The California Indian Museum and Cultural Center (CIMCC) is updating information and generating ideas on tribal language learning, resources and technological tools. CIMCC will collect survey data and produce a language status report and a guidebook on existing language resources. This report will be available Summer 2018. 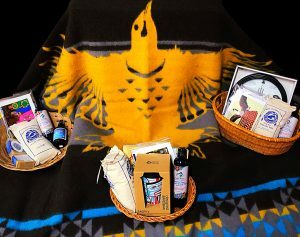 Survey participants will be entered into drawings for a number of prizes by California tribal artists and vendors. Prize winners will be notified as selected. We appreciate your time and contribution to using, saving and sharing our tribal languages.